My daughter and I decided to stop into a local Asian grocer to kill some time while her sister participated in swim lessons, and after browsing cluttered aisles and overflowing shelves packed to the brim with myriad pre-packaged food products that all appeared to contain seafood of some kind, we finally decided to make our way back to the front to check out the eighties-style display coolers to look for obscure sodas. Boy, did I find one(along with another fruity soda that was a new brand but old favorite, which I will review another time). I found Sarsi. A short, rather squat bottle with a red-white and blue color scheme reminiscent of two of the three most popular cola brands(Pepsi and Royal Crown), and the sickly-thick brown color to match. I got out to car, and went to open it and take a sip-only to find that it was(unsurprisingly) not a twist-off cap. So, I proceeded to unbuckle myself(safety first! ), and my daughter and haul the sodas back inside in search of a bottle opener. I asked the man at the front, whom instructed me that the lady working in the cooler had one. After following my nose to the cooler-which at once reeked of rotting fish and dirty bleach-water, I had freed my beverages from their metallically capped prisons. I got outside, took a sip, and was floored by an amazing flavor. It was familiar, but I couldn't place it. It wasn't like any other cola(although it had small hints of the background bouqet of China Cola), but it also wasn't like any other one thing I'd had before. So-research was in order. The bottle let me know this specific one was from Singapore, but upon researching the brand name I learned it is produced in the Phillipines, and is a Sarsaparilla beverage. That explains why I recognized the flavor. 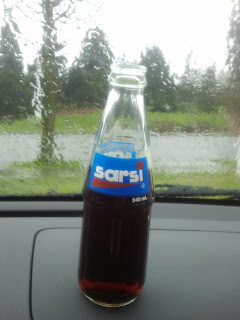 I also discovered that Coca-Cola tried to bring down Sarsi's hold on the "root beer" market(not that I'd ever call this a root beer) by releasing Barq's to the area. Lo and behold, Sarsi destroyed Barq's in sales, so Coca-Cola stopped competing- they pulled Barq's from the shelves/restaurants in the Phillipines and simply bought Sarsi. I guess that was one way of doing it. Anyways-onward! Simple, to the point-but slightly misleading. I was expecting something a little more cola-like in taste based on the colors alone. Don't really know what color it should be, but maybe blue over orange would have been good-Cola Root Beer would have both been evoked and left me with no expectations but no surprises. Smelled slightly herbally, and very sweet. Sugar and slightly root beer-esque, but not much so. Tastes good. Sweet, a little tart, some tang to it, and quite drinkable overall. I could drink this to refresh myself, to have something to sip on during the car-ride to work. Strongly preferred over a lot of other drinks-wouldn't consider it a root beer or a cola-maybe something in between. Really well put together soda. I see why it sold so well and has been distributed across the globe. It's incredibly flavorful without drawing many comparisons.